Description: Small garden in the middle of an intersection on Av. Nove de Julho. Plaque dedicated in honor of two Brazilian victims. 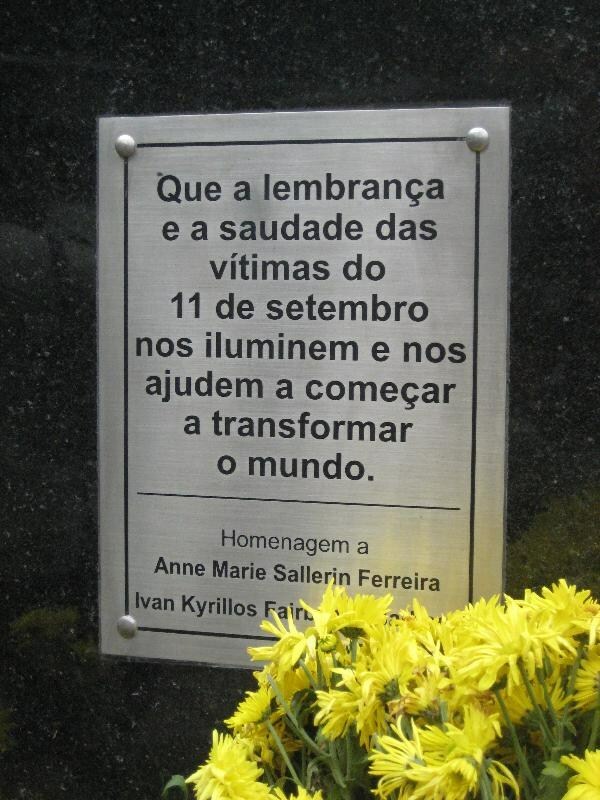 Original: "Que a lembrança e a saudade das víctimas do 11 de setembro nos iluminem e nos ajudem a começar a transformar o mundo. Homenagem a Anne Marie Sallerin Ferreira, Ivan Kyrillos Fairbanks Barbosa." Translation: "That the memory and the longing of the casualties of September 11th enlighten us and help us to begin to change the world. In honor of Anne Marie Sallerin Ferreira, Ivan Kyrillos Fairbanks Barbosa.